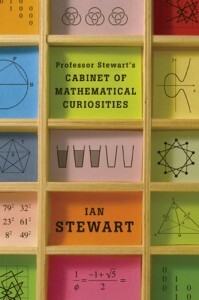 Professor Stewart’s Cabinet of Mathematical Curiosities by Ian Stewart | Blah! I picked this up randomly at a bookstore in Santa Fe, intrigued by the thought of delving into a little bit of math. And that is just what this is. Professor Stewart’s Cabinet of Mathematical Curiosities, by Ian Stewart naturally, is a tour de force of many of the most interesting corners of math, both historical and modern, covering each just a little bit. Each topic is never given more than a couple of pages, though some of the topics do join together. He covers everything from regular polyhedra (Platonic solids) to Fibonacci numbers to the shape of oscillations on a drum head to complexity science. He gives just enough to tantalize, to intrigue, to whet the appetite. The history of math is also scattered throughout with brief mentions of many of the important mathematicians. Finally, there are lots of exercises and puzzles for the interested reader which, I admit, I was not — after so many years of school, I’m hard pressed to do anything that appears like homework. But, the solutions are in the back of the book and offer further insight into the mathematical topic at hand. There were two concepts that particularly caught my attention, mostly because I hadn’t heard of them before and they are so interesting. The first is Benford’s Law. Imagine you are working at a company and you decide to cook the books a bit, creating false transactions. You might think that the numbers associated with the transactions should essentially be random, that, for example, the number of transactions starting with 1 (like $10224) should be about the same as starting with 2 ($221) and so forth. In reality, this isn’t true. If you look at the distribution of house numbers in a city, or the size of islands in the Bahamas, or the GDP of the nations of the world, numbers starting with 1 are more common than 2 which are more common than 3, and so on. This fact is Benford’s Law, and it is used today to catch embezzlers and others who don’t realize that the distribution of these numbers isn’t random, but follow this pattern. Wikipedia, naturally, has a nice article about Benford’s Law. Ok, the second example I’ve heard about but it is presented in a very nice way. That example is Penrose tiles (here is the Wikipedia article about those). If you think about tiling the plane, like say tiling your bathroom floor, there are three shapes you can use that will let you completely tile the floor: (equilateral) triangles, squares, and hexagons. These, in turn, give you patterns that have 3, 4 or 6-fold symmetry (if you rotate your view direction by 120, 90, or 60 degrees, the pattern will look the same). It was thought that 5-fold symmetries are impossible: you can’t tile a floor with pentagons. However, Roger Penrose showed that if you use two shapes, a kite and a dart, you can tile the floor and get a 5-fold symmetry. What’s more, the resulting pattern is not completely periodic. It has short range, but no long range order. Why does this all matter? Well, symmetries are crucial for understanding crystal structures: atoms arrange themselves in patterns that are the three dimensional equivalent of these 2-D patterns. Again, no one thought that 5-fold symmetry could exist, but on the surface of chemical compounds, “quasi-crystals” can form, which exhibit the same patterns that Penrose tiles do. Very cool! This book offered lots of glimpses into many unfamiliar corners of math, and as such was very interesting. He describes each topic at a level that the basic idea can be gleaned by those who have little or no math background. I highly recommend this book to anyone who has even a vague interest in math. One final note: in the previous book I discussed, The Golden Ratio by Mario Livio, he claimed that the nautilus shell followed the logarithmic curve. Stewart says that isn’t so: the shell is wound tighter than a logarithmic curve would dictate.